As we attempt to lose weight, or attempt to maintain a loss, there is often a struggle due to the fact that weight loss is often a more complex issue than first imagined. It is often accompanied by a negative body and self-image, low self-esteem, respect and confidence.Counterproductively, experiencing the afore mentioned is often what drives us to comfort eat. You may feel that you will be happy with yourself and confident once you are X – weight, however, happiness and confidence is not supposed to be dependent on our body image. Of course, when we live a healthy lifestyle this can bring happiness and confidence as we are doing right by our bodies and health even though these choices aren’t always easy. Your actions, commitment and perseverance to living healthily should build your confidence and happiness – not the goal weight at the end of the journey. You have hundreds of various features that encompass you, to have one feature determine your self-esteem is entirely nonsensical. Determining the worlds worth on one country would seem silly, wouldn’t it? Unfortunately, It is a fact of life, that things do not always go smoothly, and we are often left with mental scars, and sometimes these bear deep, develop and unravel, until our self-esteem, respect and image are negatively impacted by our experiences. On the contrary to what some people believe, self-esteem is not something set by our job success, how others see us, our parents or our failures. A healthy self-esteem is something we should work on internally, remaining at a constant level, unaffected by external factors. To build a good solid self-esteem requires continuous effort, just as you would nurture and engender a sense of significance and self-worth into a child, you should do the same for yourself. This is your chance to take control from the inside, you are worth a healthy body and mind. In order to unravel some of the cognitive distortions you may hold, you must become aware of which distortions you are harbouring, and which you are most vulnerable to. The following information and exercises are here to encourage you to identify and challenge harmful and automatic thoughts. Cognitive Behavioural Therapy (CBT) aims to change our thought patterns, counterproductive/ negative beliefs, our attitudes, and ultimately our behaviour – in order to help us face our difficulties and, in turn, excel and strive towards our goals. The principle being that our thinking patterns affect our experiences for both better and worse, therefore by focusing on altering these patterns – you can change your feelings and experiences. CBT is often performed with a therapist in weekly sessions, however, within this guide will be small CBT based exercises that you can use to identify and further understand the power of your thoughts. Then you can begin to apply this knowledge and these exercises into your everyday life. As individuals attempt to lose weight, or attempt to maintain a loss, there is often a struggle due to the fact that weight loss is often a more complex issue than first imagined. It is often accompanied by a negative body and self-image, low self-esteem, respect and confidence.Counterproductively, experiencing the afore mentioned is often what drives us to comfort eat. You can use CBT to begin to counter any negative feelings toward your self, as well as use this as a tool for dieting. CBT has been shown to help individuals stick to their diet, by helping issues such as motivation, frequent snacking, excessive alcohol consumption, binge eating and eating in response to mood (comfort eating). It acts as a tool to help deal with difficult situations, emotions and cravings. Improving one’s mood and sense of ability to abstain from damaging health behaviours, in regard to health goals. These exercises are useful for identifying your triggers, negative thoughts and outcomes of these. Once you have identified these you can begin to notice and use CBT techniques in your everyday life. A simple exercise you can do to recognise how emotionally charged and distorted some of your thoughts may be, is to write down some of the negative thoughts you hear most often on the left-hand side of a page, then on the right-hand side, simply and objectively sort them into fact or opinion categories – see example at the bottom of this page. There is no grey area here, it is fact OR opinion. For example “I forgot to do the laundry last night” – this is a fact, versus, “ I am useless” – this is an opinion. Once you begin to identify what opinions you have that are strongly distorting your self-worth, you can begin to find the root and start to unlearn this opinion. You may be surprised as something so hard-wired into your psyche may feel factual, you may tell yourself “I am worthless” so often that it feels factual, this is very damaging, and is your opinion, and it is highly unlikely those around you agree. Writing these down helps us to judge our thoughts objectively, and this opens the door to questioning our opinions. Why does it feel factual to you? What determines your worth? Are you a good person? Is it salary and status ? Did someone else give you this label- are they a reliable source for truth? If you spoke to a friend this way would they stick around? The more you analyse these thoughts, the more they will unravel and you may notice that the labels you identify with yourself do not truly apply, and no longer serve you. It is time to let these go. 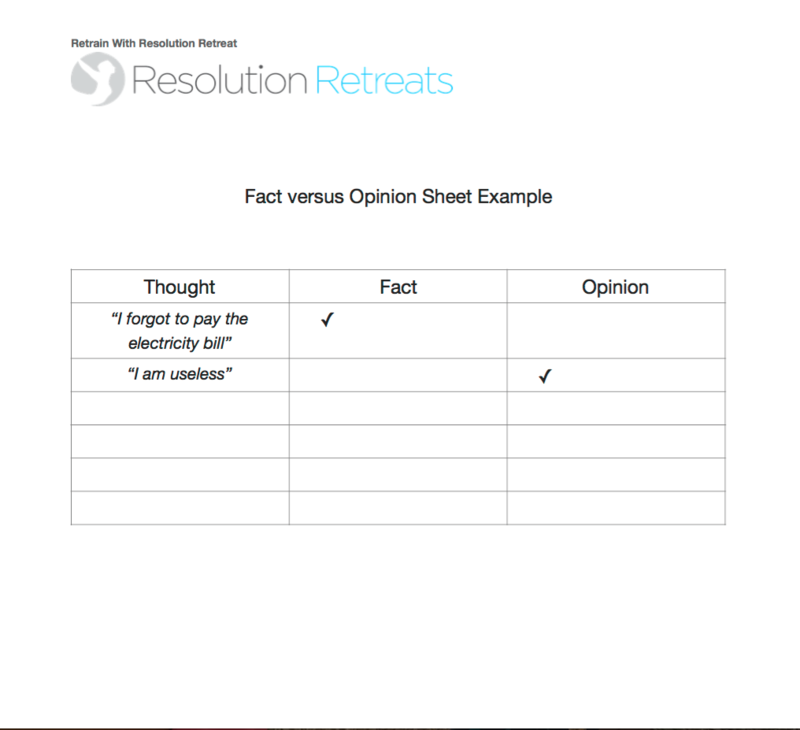 The following exercise ‘Self-Statements’ can be used in conjunction with this exercise to help rid persistent negative opinions. The following technique can be difficult at first but studies show it to be extremely effective. When you are experiencing a negative thought(s), they can be uncomfortable to confront, but in order to make positive changes, you must start to actively begin to counteract them. Take a negative thought that you repeat to yourself, and then write down the opposing statement. For example: If the thought that you are “Worthless” and “What’s the point in even trying to be healthy” reoccurs, you would write down the opposing statement – “I deserve to treat my body compassionately, I am worthy of health and happiness’. Write these down in a notepad if you wish to work on these privately, however it can be very affective to write them on post-it notes and place them in frequently visible areas, your bathroom mirror or dash board for example, so that you are likely to read these statements every morning. The morning is a very fragile time period and can really determine your frame of mind for the day, therefore, bombard yourself with positivity and self-compassion when possible. It may feel like a constant tug of war in your head at first, but you need to catch and challenge all the negative thoughts and begin to fight back. Slowly it will become easier and the negative thoughts will be phased out. Repetition is key as this is what re-wires your brain and slowly makes the positive thoughts more readily available, and your well trained negative schemas (thoughts/thought patterns) will begin to weaken and wither away. On a similar note, observe the language you use with your internal narrative. Be aware of using words such as ‘Cheat Meal’, ‘Clean eating’ or ‘Naughty’ and ‘Bad’ when dieting. Food provides fuel and nourishment, and on the other hand in moderation can provide a treat, and treats are meant to be enjoyed without any guilt or backlash. Try using words like ‘Satisfying’, ‘Nourishing’ and ‘Delicious’. This will give you the best chance of creating a healthy and balanced relationship with food. A widely used CBT technique is functional analysis. This helps you to learn about your behaviour, your triggers, and the result of these. Most importantly it helps you to plan your new behaviours, so that you are prepared when the occasion arises in real time. 1) ‘Behaviour’- In this box, write down any behaviours you wish to analyse. For example “I ate a whole box of chocolates, I couldn’t stop myself”.
. Example “I cried, and locked myself in our bedroom, I got into bed and kept picking at a box of chocolates I had …and eventually I had finished the whole box”. 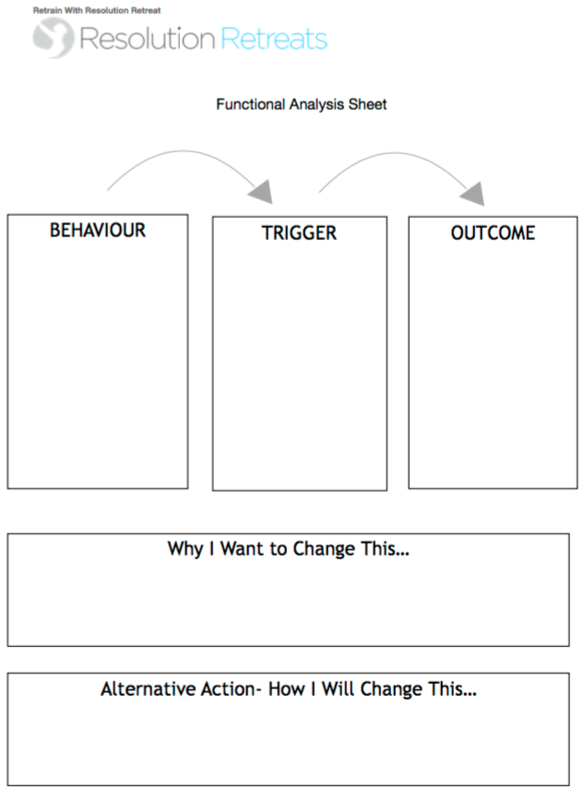 4) ‘ Why I Want to Change This…’- Fill out the alternative action box by stating why you want to change this. This can bring home what exactly is driving you to change. By writing it down you are confronted by your motivations that may be buried. You may think you want to lose a few pounds to fit into a dress, when really you want to feel good in your skin, proud of yourself and confident. Maybe your motivation is to prove to everyone who doubted you, that you are a strong-willed hard working woman. There’s no right or wrong answer for this box, the only thing you need to be is honest. Example “I want to change this because it leaves me feeling sickly, not to mention disappointed in myself, I just felt so lost and upset, I didn’t feel strong enough to resist them”. 5) ‘Alternative action box’ – The next box is how you will change this – provide future you with new actions and, in turn, solutions to your triggers, preparing and supporting, you and your health goals. Example “Next time me and my partner argue, I will call my sister for support, or if I don’t feel like talking to anyone I will do some gardening to keep busy while I process what’s happened”. Productive actions are great also as these are likely to trigger the reward centre and sense of achievement at the end of the task – think organising and cleaning out your wardrobe, or even the massive handbag you use every day that has accumulated its own clutter. This will help you locate what particular triggers and behaviours are destructive and self- sabotaging. You may notice a lot of them are environmental also, this may mean changing your environment or daily routine as mentioned in the habit module. This exercise also helps us to confront what it is that drives us to food, helping us to face uneasy feelings and deal with them in a proactive manner.